Kent style louvered cupolas are the epitome of classy charm. These beautiful roof ornaments can be used for decoration or to cover up unattractive vents, fans or exhaust pipes on any rooftop with up to a 10/12 pitch. At Millworkcity, we’re proud to carry louvered Kent cupolas because they’re virtually maintenance-free, practical and affordable. They’re made from sturdy PVC, which means they’re naturally weather-resistant and durable, and topped with wood for extra style. Each surface can be painted to match the exterior of your home, barn or other structure. 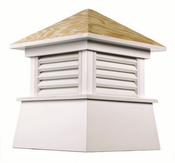 With slightly sloped bases and open-air vents that promote airflow in and out, Kent louvered cupolas are a smart choice for almost any project. When you work with us, you’re getting more than fantastic roof ornaments; you’re getting remarkable customer service from beginning to end, and we’re looking forward to being your cupola supplier. Our expertly crafted Kent® windowed cupola features timeless American style. The wood roof offers flexibility to shingle or cover with a metal roof. Measures 72” W x 97” H. Builders rule of thumb: 1.5 inches of cupola width for every foot of unbroken roofline. Measures 84” W x 113” H. Builders rule of thumb: 1.5 inches of cupola width for every foot of unbroken roofline.